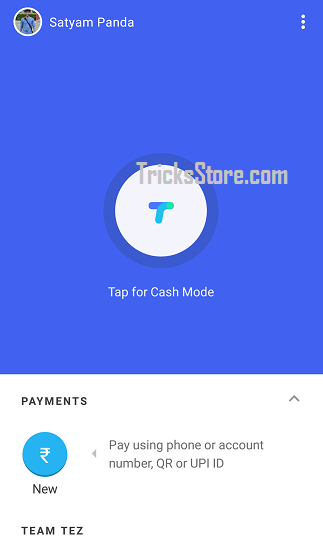 Google Tez App Full Guide How To Use Tez UPI Android App – Hello Friends , Hope You are Well And Enjoying Every Free Recharge Tricks By Trickstore. We all Know Google Launched it’s Own UPI Tez App By which you can send and receive Money Instantly to any One . Tez app also comes with Rs 51 cash back Refer & Earn scheme from which you can earn up to Rs 9000 easily By just Inviting Your Friends plus Lucky draw system also. Google Tez is a New Google Payment App And Today(On 18th Sep) Google Launched This App In India. 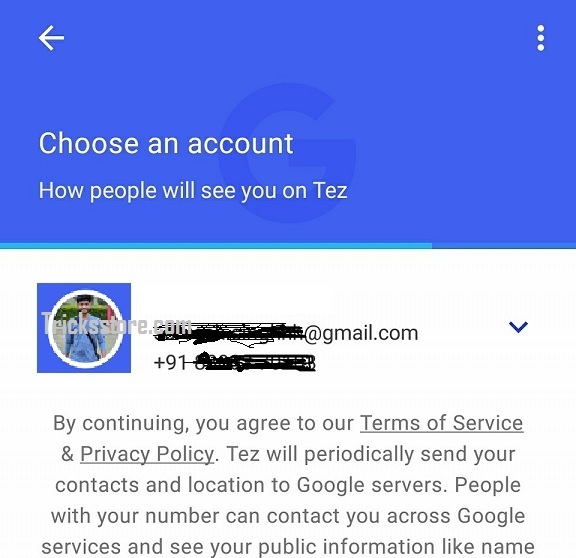 By Google Tez Yoy Can Send or Receive money with your friends directly with your bank account & You Can Also Use google Tez App To Bill Payment. UPI in full means is Unified Payment Interface which is apparent of IMPS (Immediate Payment Service) And It Makes Ease Of Transaction trough Bank Accounts Easily. 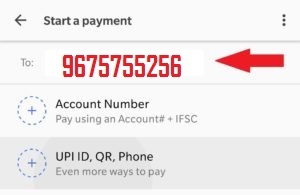 So That sending money to anyone with your bank or other bank Directly.With UPI Service you don’t Need To Give Your account details like Your Bank Account Name, Account Number, Branch Code or IFSC Code , Than You Are Thinking About What we Need? so friends, You need Only an UPI ID which looks Similer To Your Email address. What is Google Tez App Offering Now? Google Tez App Is Also An UPI App Which Makes Your Transaction Easy and Secure. All You Need Is Only An UPI-ID To Send Or Receive Money Directly With Your Bank Account. As This App Is Newly Launched So That They Are Giving Free Referral Money To Their Users. The Referral Amount Is 51 rupee When Your Referred Friend Make Their First UPI Payment. 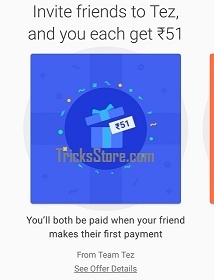 I alredy mentioned That Tez app Giving Rs.51 When You Will Invite Your Friend To Download Tez App Apk On Your Phone, and Your Invited Friend too earn free Rs.51 When Your Friend Make Their First UPI Transaction. You Will Your Free Tez Cashback in your Google Tez Reward section. And Further You can use that Earned money to send and receive in your bank account. Now as a Promotional Offer Google Tez Refer And Earn Program Is On Going, In Which You will Get Rs.51 per Refer means when you Refer Tez App To Your Friend And That Referred Friend makes Their First UPI Transaction. 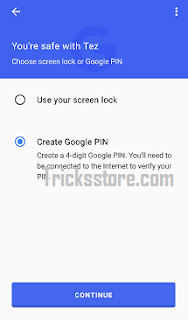 How To Make Account In Google Tez App? 2. After Download Just Install And Open the Tez UPI app. 5. Now You Have To Chose Your Google account linked with Mobile number. 6. 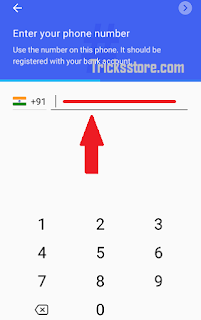 Now Tez Just Secure Your Tez App With 4 Digit Pin Code. Here You Done!! You Successfully Installed Your Tez App On Your Mobile Phone. 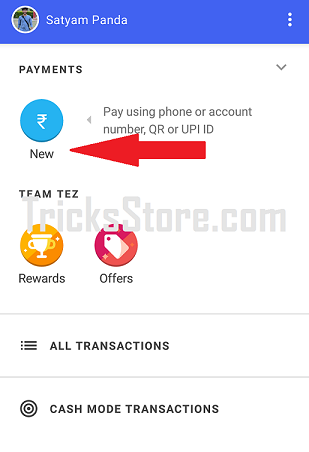 After These Steps You Will Reached In Home Page Of Google Tez UPI App.Now I will elaborate You To How To Link Bank Account In Tez App. 7. On Tez App Home Screen Click On Top Of Your Name To Add Bank Account. 8. 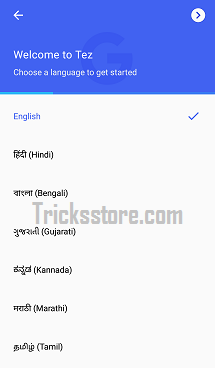 Here You Will Get Full Bank Name List >> Now Choose Your Bank which you want Link on Tez app. 9. Now Enter Your Old UPI Pin to verify It or Just Register Your Self And Make UPI PIN. 10. Now You Successfully Linked Your Bank Account with Tez app . 11. On The Home Page & Click On New Button Which Lands You On Different Payment Method. 12. Here Just choose UPI ID, QR ,PHONE option . 13. Now Just Send Rs 1 Only to this ID by entering Your UPI Pin and Instantly You will Get Rs 51 Cash back on Tez app Reward section. Bingo ! You all are set enjoy the offer. 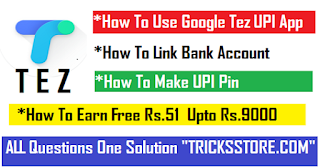 *Here You Will See The Banner Saying Reffer And Earn Rs.51, Click on Invite Friends and Start Sharing your Refer Link.